Phil Ware reminds us that Communion is a powerful example of Jesus taking something profound and making it simple enough for us to understand and do together. Phil Ware continues his reflections on Holy Communion by reminding us of coming reunion that The Supper ensures will happen! Phil Ware continues his series called Beyond Bread and Wine and focuses on the three sets of words we most long to hear. Phil Ware challenges us to remember that Jesus was God made touchable and that Communion makes God touchable to us again. Phil Ware reminds us that The Lord's Supper is not a time to just look back, but also a time of great anticipation and eager expectation for the Lord's return. Phil Ware reminds us that our times at the Lord's Table should be filled with the same kind of people who joined Jesus at the table when he was on earth! Why is our sight so short-sided that we cannot see the whole world at Jesus' Table of grace? Phil Ware continues his series on 'Beyond Bread and Wine' focusing on Jesus' death for the sin of the whole world and a special Sunday in Bangkok, Thailand. The Father has given us a simple way of remembering the significance of this Supper: our hands! Phil Ware continues his series of Communion devotionals called 'Beyond Bread and Wine' with a reminder that our often taken for granted hands can lead us to a profound grace! Don't be fooled by the simplicity of this meal, but be reminded that Jesus makes simple things glorious! Phil Ware reminds us that though the bread and wine of this meal are simple, so were Jesus' words to Jairus' daughter, and those words changed everything. The Lord's Supper is our regular reminder that Jesus is coming for us to share in his victory! Phil Ware continues our focus on the Lord's Supper called Beyond Bread and Wine: this week our focus is on Jesus' return in glory! Phil Ware reminds us that we share in The Supper, not because we are worthy of Jesus' sacrifice, but because we've been made worthy by his sacrifice! Phil Ware reminds us that Jesus made great promises in the context of his Last Supper and one of them promised that we would do greater things than he did. As we share this bread and drink this cup, let's be reminded of our home on the horizon and the joy we will share when we arrive! Phil Ware talks about longing for home and the food of home and challenges us to see Communion as our taste of home while we are away. Why is it so important to recognize that the bread is broken? Because we are broken, too! 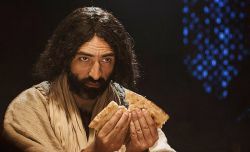 Phil Ware continues his series of Communion Devotionals called Beyond Bread and Wine that focuses on all the depth, meaning, and significance to the Lord's Supper. What the resurrected Jesus gave to his shocked disciples who disbelieved for joy was tangible proof he had risen from the dead! Phil Ware begins the new section with a reflection on the Lord's Supper and what it can mean for us. For more 'Beyond Bread and Wine' articles visit the archives.